The Aditya Hridayam Hymn is part of the Yuddha Kanda of Valmiki Ramayana (the chapter of war) and contains 31 slokas. ‘O Rama’, ‘O Mighty armed elegant Rama’, listen carefully to the eternal secret by which, ‘O my child’, you shall conquer all your enemies on the battle field and win against your adversaries. By Chanting the Aditya-Hridayam (the meditation of Sun in the heart ) which is very auspicious and highly beneficial, you will be victorious in battle. This holy hymn dedicated to the Sun-God will result in destroying all enemies and bring you victory and permanent happiness. 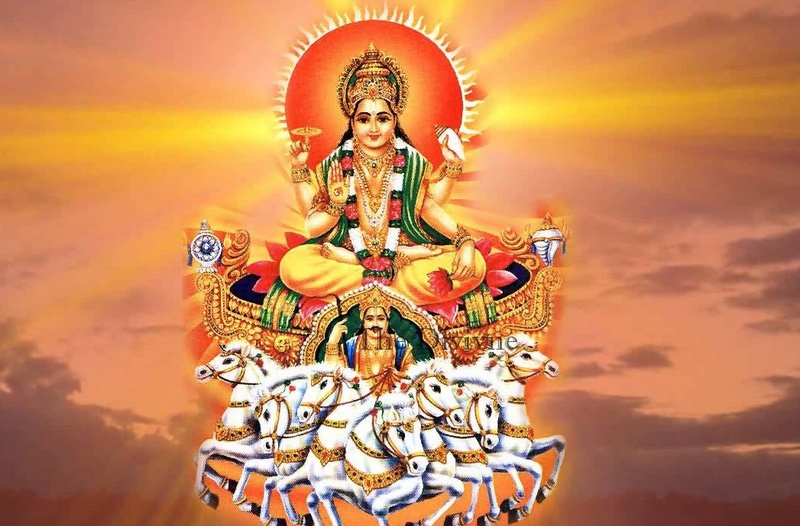 Worship the sun-god, the ruler of the worlds and lord of the universe, who is crowned with effulgent rays, who appears at the horizon and brings light, who is revered by the denizens of heaven (devas) and asuras alike. He is Brahma (the creator), Visnu (the Sustainer), Shiva (the destroyer), Skanda (the son of Siva), Prajapati (progenitor of human race), the mighty Indra (king of heaven), Kubera (the god of wealth and lord of riches), Kala (eternal time), Yama (the Lord of death), Soma (the moon god that nourishes), and Varuna (the lord of sea and ocean). He, whose form is circular and is colored in yellow and red hues, is intensely brilliant and enegetic. He is a giver of heat, the cause of all work, of life and death. He is the destroyer of all and is the Omniscient one sustaining the universe and all action. Oh! Lord of thousand rays, son of Aditi, Salutations to you, the bestower of victory, auspiciousness and prosperity, Salutations to the one who has coloured horses to carry him. Salutations to the Lord who abides in the heart of all beings keeping awake when they are asleep. Verily he is the Agnihotra , the sacrificial fire and the fruit gained by the worshipper of the agnihotra. Listen Oh Rama! Oh Ragava, scion of the Raghu dynasty, any person, singing the glories of Surya in great difficulties, during affliction, while lost in the wilderness, and when beset with fear, will not come to grief (or loose heart). O mighty armed one, you shall truimph over Ravana this very moment. After blessing Lord Rama thus, and predicting that He would slay (the demon) Ravana, sage Agastya took leave and returned to his original place. Having heard this, that great warrior Raghava, feeling greatly delighted, became free from grief. His clouds of worry thus dispelled, the lustrous Lord Rama obeyed the sayings of sage Agastya with great happiness.With composed mind he retained this hymn in his memory, ready to chant the Aditya-Hridayam. Having performed Achamanam (sipping water thice) and being purified, Rama gazing at the sun with devotion, recited the hymn Aditya-Hridayam thrice, then that great hero Raghava was thrilled and lifted his bow. Then knowing that the destruction of Ravana was near, the Sun-God Aditya, surrounded by all the Gods in heaven, looked at Rama with delighted mind and exclaimed ‘Hurry up’ – ‘Be quick’.